The first church services were held in the homes of families living in Engadine area around 1900. In 1910 a Methodist Missionary, Rev. McPritchard, held services in the Presbyterian Church. Soon he moved the church to a building on Main St. which is now being used by the DeWyse Construction Co. In 1914 a group of 12 families moved to Engadine from Rockville, Ky. Mr Ephriam Elliott brought them here to start the cooperage mill. Most of the people had been baptized Methodist in Ky and wanted to build a church. Mr. Elliott took the responsibility of raising the money for the church; He took pledges form the men and deducted the money from their wages. Mr. Elliott then contacted Sears and asked them for a donation, indicating that many of the families bought from their catalog. Sears donated enough paint for the first coat on the new church. The church was completed and dedicated on January 24, 1915. The dedication sermon was given by District Superintendent, Reverend J. Dystant, Ph.D. This church was to be known as the Elsigood Memorial Episcopal Church as requested by the Board of Home Missions & Church Extension. Reverend H. Bennett was the first pastor of the new church. The Ladies Aid Society was soon organized & took an active part in the welfare of the church. In 1940, capitalize Women’s Society of Christian Service took the place of the Ladies Aid Society. All Methodist churches throughout the country made the same change. building fund, they put in a 20’X40′ foundation. The Iabor and materials were donated. The addition provided a fellowship hall, kitchen, bathroom and furnace room. The addition was dedicated on July 15,1961 by Bishop Reed, Rev. Gonser, District Superintendent and Rev. Chapko. In 1965 we had our 50th Anniversary. In 1973 a new parsonage was consecrated by Rev. Vernon Wyllys. He and his family were the first occupants. On July 15, 1979 a church library was established by Marjorie Cousino. She was assisted by Leona Smith, Beth Bennett, Mary Bricker and Ruth Foote. In 1982 a new main entry was built. A new altar area was added and the entire interior of the church was refurbished. New carpeting and exterior white siding were added. This first phase was started by Rev. Audrey Dunlap. In 1985 the second phase of the building program was underway. Rev. Audrey Dunlap was pastor as this time also. This project included a 16’X40′ addition which was added to the 1961 addition. A new roof was installed over the entire addition and siding. This addition gave us 6 class rooms, a new kitchen, a new storage room and two barrier-free bathrooms. In 1986 Engadine joined the other six churches to form the Co-operative Parish. 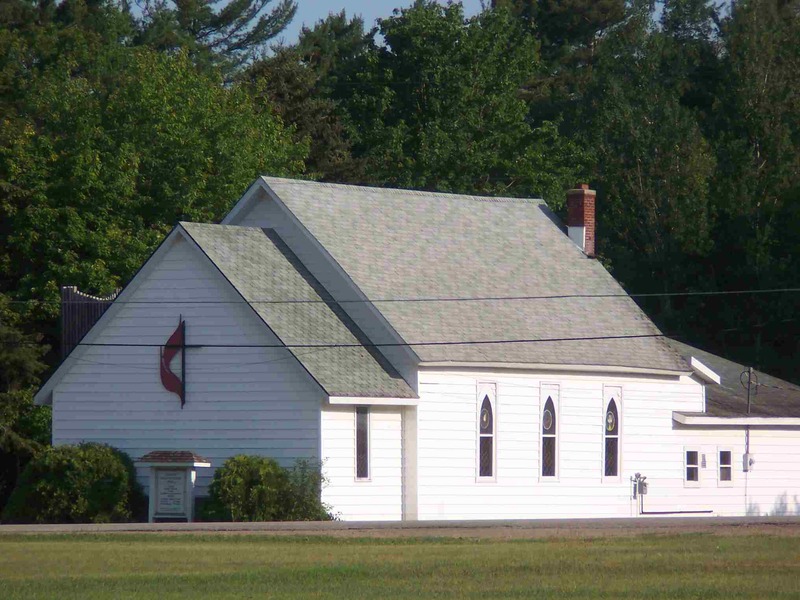 The Co-Operative Parish includes Germfask, Paradise, Hulbert, Grand Marais, Newberry, McMillan, and Engadine, We would eventually be called God’s Country Cooperative Parish. June 1,1987 thru September 30, 1987 we were without a pastor. Mr. James Gribbell, a Lay Speaker took over until our new pastor Rev. Philip Voss arrived on October 1, 1987. Since our building project in 1986 we have added an office and new entry way in the back of the church which makes our church handicap accessible. Pastors who have served the church since 1948 are: John Brodne,1948-1951, Konstantine Wipp, 1951-1953, Vernon D. Wyllys, 1953-1955, Helen Royce, 1955-1957, Mrs. J. Bruce Brown, 1957-1958, G.E. Moran, 1958-1961, Stephen Chapko, 1961-1965, Carl Shamblen, 1965-1969, Vernon C. Wyllys, 1969-1975, James Lumsden, 1975-1976, Audrey Dunlap, 1976-1985, Ramona Cowling, 1985-1987, Phillip D. Voss, 1987-1991. Since Pastor Voss we have had pastor Bo Lange, Pastor Ron Piette, Pastor Max Weeks, and Pastor Saundra Clark. At the present time we have Pastor Tim Callow. Leatha Legault was the adult Sunday school teacher and organist for many years.